Are you tired of coming home from the grocery store and feeling like you have little to show for the money you spent? That is because you are wasting money at the supermarket! With prices on food constantly going up (the hot dog buns I buy have doubled in price in the last year), it is easy to feel depressed when you come home from grocery shopping only to find your money didn’t stretch as far as you had hoped it would. What if I told you that you could fix that? What if I told you that you didn’t have to feel that way every time you walk out of the supermarket? You can easily fix this problem TODAY and you never have to feel depressed and defeated when you walk out of the grocery store ever again! Below is a list of 18 tips and tricks that can help you save big at the grocery store and have more food to show for your money! Lets start saving! #1: Never shop when you are hungry! This should probably go without saying but you should never go to the grocery store on an empty stomach. The hungrier you are, the more everything in the grocery store is going to look good to you and you will just end up buying a lot more food than you went in there for. It is best to go to the store after you have eaten but if that is not possible, just make a list and be sure to stick to it. #2: Make a list and check it twice. Santa isn’t the only one who should be making a list and checking it twice. Before you go to the grocery store, make a list of everything you are going there for and stick to it! Not only will this serve to keep you from forgetting to pick up a key ingredient to the dish you are planning on making but it will help keep you from buying stuff you didn’t go in there for. It is important to get what you are after but make sure you aren’t buying something you don’t need! #3: Pay attention to sales! When you are making your list of things you are planning to buy when you visit the supermarket, always make sure to check the store’s local circular first to see what is on sale. If you don’t have a brand preference on an item that you need, you may find that another brand is on sale instead of the one you normally buy which can save you a lot of money. #4: Don’t leave home without coupons, digital coupons and your loyalty cards! 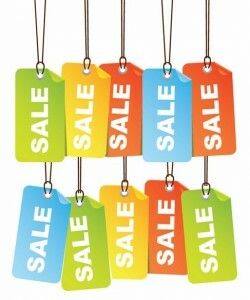 Speaking of saving lots of money, perhaps the easiest way to save money is coupons, digital coupons and loyalty cards. Many stores only offer their sale prices to people who have signed up for their loyalty programs so make sure you never leave home without your loyalty card. Not only that, many grocery store chains work with local gas stations to give you a discount on gas when you buy a certain amount of stuff from the grocery store so the loyalty cards can even save you big bucks outside of the grocery store! One of the major grocery stores where I live also lets you buy 9 cups of coffee and get the 10th free at one of the local gas station which is nice if you drink a lot of coffee. However, loyalty cards aren’t the only way to save lots of money as you can easily find coupons for lots of items in your local newspaper (usually on Sundays) and online. Speaking of online, some stores even have their own smartphone apps or mobile websites that offer digital coupons that can save you even more so make sure you take your phone with you when you go shopping. #5: Stock up on sale items with a long shelf life. When you find some good deals from your grocery store of choice (and don’t be afraid to go to other stores for more money saving deals), feel free to stock up on the item if it isn’t going to spoil right away and you know you will eventually use it. Canned goods and other non-perishable items like toilet paper are the perfect candidates for things to stock up on when you find a good sale. Just make sure you are going to use what you buy! #6: Only buy in bulk when you will use it all! One of the biggest mistakes I see people make when it comes to shopping is buying stuff in bulk only to end up throwing most of it away because it didn’t get used before the expiration date. If you are going to buy a giant sack of potatoes or anything else with a short shelf life, make sure you have a plan to use them all before they go bad or they will end up in the trash which is the same as throwing your money in the trash. Buying in bulk can save you a ton of money as long as you make sure that you are going to use what you buy. #7: Ask for a rain check on sold out items. How many times have you made it to the grocery store to find the item you wanted that was on sale to be gone or the person that got there 3 seconds before you took the last item? When you encounter this situation, ask one of the employees if you can get a rain check on that sale item and still get the sale price when it comes in? Many stores will do just that and even if they don’t, it doesn’t hurt to ask and it can only save you money! #8: Beware of the inner isles. Have you ever noticed how the main things you go to the grocery store are on opposite sides of the store? For example, at my local Safeway, at one end of the store is the fresh produce section while the bakery is on the opposite end. Grocery stores have this type of layout because they know they can get the hungry and weak willed to browse the isles between those sections and end up selling them more food than they had intended to purchase. However, if you stick to your grocery list, this shouldn’t be a huge problem for you. 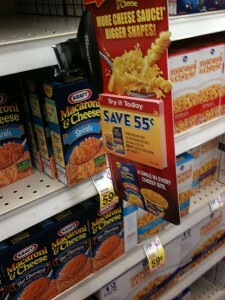 #9: Don’t just buy items at eye level! If you find yourself in an isle looking to buy a particular item, make sure to look up and down on the shelves for the best buy before you put the item in your cart. Often, grocery stores will put the more expensive items at eye level while the cheaper stuff is higher or lower on the shelves. They may not be the same brand as what you were looking for but if you are a little flexible, you can save big by buying the cheaper brands that aren’t right in front of your face. #10: Don’t be afraid of buying the store’s brand. One of the other big mistakes I see people make is they usually reach for the popular brand names and ignore the store brand thinking the quality or taste may not be as good which is often not the case. Store brand items are often little more than re-labeled brand name products so don’t be afraid to compare the ingredients lists as there is often no difference between the two. Also, it is a myth that store brand stuff doesn’t taste as good as the big brand names. Just this week, I bought a 1.5qt container of vanilla bean ice cream that was the store’s brand (Safeway in case you were wondering) and I liked it just as much as the vanilla ice cream from Ben & Jerry’s that I usually buy. However, there was one big difference and that was the price. A pint of the Ben & Jerry’s cost around a dollar more than the 1.5qt container of the store brand ice cream. Not only did I get a lot more, I paid a lot less too! #11: Compare the unit price of items. Speaking of comparing prices between brands, don’t just look at the price of an item, look at the unit price too! The unit price which is usually on the side of the price tag will tell you the cost of the item per ounce. Knowing how much you are spending for what you are getting is one of the best ways to compare prices to make sure you are getting the most bang for your buck. No matter what it is, if you don’t do it yourself, you are paying somebody else to do it for you. Pre-made foods can be really convenient if you just want something take home and eat with no more preparation than perhaps throwing it into the microwave for a couple of minutes. Unfortunately, if you don’t take the time to cook something yourself, you are going to end up paying somebody else to do it for you. You can often save yourself quite a bit of money if you buy the ingredients and make something yourself rather than having it made for you. This also has the added bonus of improving your skills in the kitchen too! #13: Never buy prepackaged salad. Speaking of avoiding pre-made food, salad is one of the biggest offenders for costing you a lot more money than you should be spending. Pre-made salad can often cost you 3x what it would if you were to just make it yourself. Salad doesn’t take long to make so spend a lot less and just make it yourself. Same thing with as above but cheese is also a major offender when it comes to buying cheese that is already grated. Buy a block of cheese and grate it yourself as needed. 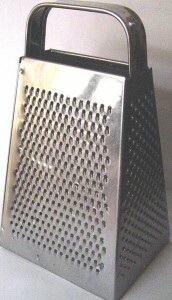 It takes only a few seconds to grate the cheese you need so save the money and just do it yourself. Just don’t cut yourself or the resulting medical bills could make grated cheese the cheaper option. #15: Buy fruit that is not already cut. Not buying fruit that is already cut feels a bit redundant after the last couple of points stressing that you shouldn’t buy pre-made foods but fruit is a bit of a special case. Not only do you avoid the same costs of having somebody else cut your fruit for you like I mentioned on the points above, but fruit that isn’t cut tends to last a lot longer. If you are going to eat your pre-sliced fruits and veggies right away it isn’t that big of a deal but if you aren’t going to eat them within a day or two, they will end up going bad and end up in the trash while fruit that wasn’t cut yet will last you a few days longer. #16: Avoid out of season fruits! Speaking of fruit, if you are looking to save money, it is important to stick to buying the fruits and vegetables that are in season. Buying something like strawberries in the middle of winter compared to summer is going to end up costing you a lot more and they often don’t taste as good when they aren’t in season. Speaking of fresh food that is in season, don’t be afraid to shop your local farmers market. You may or may not save any money, but at least you will be supporting local farmers and local food often tastes better as there is less time between when it is picked and when you buy it. 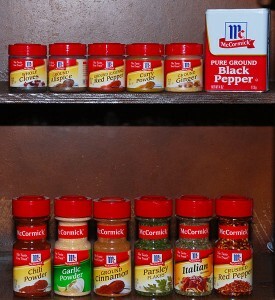 Another great way to save money is by not buying pre-made spice mixes. Not only is it cheaper to make the mixes yourself (and you get to try all kinds of cool recipes you find online), but you will often already have some of the spices in your cabinets at home that you haven’t used up yet which you can use to make your own mix without spending more money. #18: Grow an herb garden. If you really want to save on what you spend at the store, why not just grow your own stuff? Growing a large garden full of your favorite fruits and vegetables might be a little more work than most people want to put into their food but herb gardens don’t take much work and you can grow your favorite herbs in pots around the house and never have to worry about buying herbs at the store. The more you can grow yourself, the less you will have to buy at the grocery store which means the more money you will save. Those are just some ways you can save money at the grocery store but when you combine them, you can save thousands at the grocery store every year! 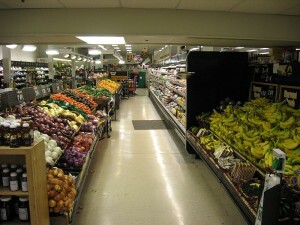 What tips do you have that people can use to save money at the grocery store? Share them in the comments below! Make sure to sign up for the mailing list below so you never miss a way to save money! Greetings and welcome to Penny Hacker? What is Penny Hacker you ask? Penny Hacker is a blog dedicated to helping you save money! Whether you are looking to save money at the grocery store or the car lot, we will be your source for great tips, tricks, coupons and other ways to help you save money on the things you buy! If there is something specific you would like to write about to help you save money, let us know through the contact page above! Otherwise, to keep up to date on all of the stuff we post so you don’t lose out on saving lots of money and any special deals we have, sign up for the Penny Hacker mailing list below! Subscribe to the Penny Hacker mailing list!